Cortana integration with third-party apps means more opportunities for voice-command fun and convenience. It might feel weird to talk to your computer, but that's something you should really get over when it comes to Windows 10. 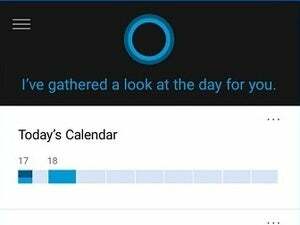 Otherwise you'll miss out on all the ways Cortana, its built-in digital assistant, can help you out: creating reminders, making calendar appointments, sending an SMS (in conjunction with a Windows 10 mobile device or Cortana for Android), and even performing chores in certain third-party apps. Yes, Cortana can be integrated with third-party apps from the Windows Store, if the feature is enabled by the developer. When it's available, it can be a magical experience that will likely have you wanting more. Here's how it works on Windows 10 for PCs—it works similarly on Windows 10 mobile devices. The first thing you have to do is identify which of your PC's apps have Cortana integration. To do this, click on the Cortana search bar or icon in the taskbar. Once the Cortana panel pops up, click the help icon (the question mark) in the left-hand navigation panel. 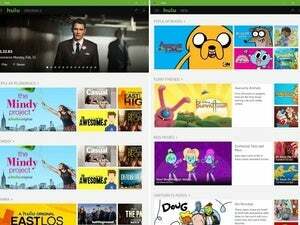 Cortana offers third-party app integration. On the help page you'll see the various stock commands that come built-in. If you scroll down to the bottom, below the solid line, you'll see the third-party apps that work with Cortana. 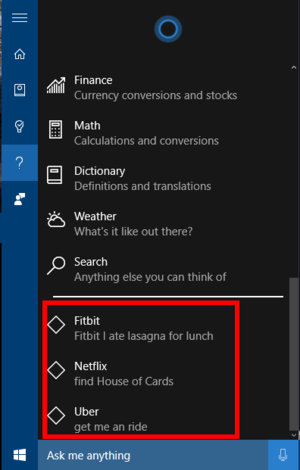 Apps that can use Cortana on my own PC include Fitbit, Netflix, and Uber. What you can do with Cortana in the app depends on the developer. With Fitbit, Cortana helps you log food; on Netflix, you can search for a TV show or movie; and with Uber, you get help finding a ride. The Cortana help section includes the recommended commands you should use for each app. Netflix, for example, uses "Netflix find [show or movie]." Cortana commands work by either speaking or typing (if you don't have a microphone or can't bring yourself to talk to your computer). 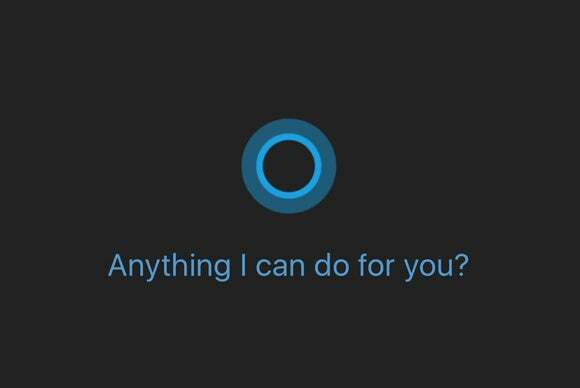 If you do use the voice feature, don't forget to start with "Hey Cortana." With Netflix you'd say, "Hey Cortana, Netflix find [name of show or movie]." That admittedly makes for some awkward phrasing, but it's effective nonetheless. Go on, try it!